When you think of Amsterdam beaches aren’t the first that come to mind. But the city does have some nice city beaches that make you feel like the hustle and bustle of Amsterdam is very far away. With the warm weather in the city we know that you want to know what the best places are. That is why we made a list of the best city beaches in Amsterdam. Spring weather can be unpredictable, going from blue skies to a cloudy day in minutes, so a city beach is for most locals the way to enjoy a sunny afternoon in the city. Pllek is the place to be for people in search of beachy vibes. Here they love animals, green and live music. Chill out in the sun with a plant-based or biological snack and a craft beer. Here you will have a fantastic view of the river ‘t IJ. Blijburg is Amsterdam’s biggest city beach. With its sandy hippie exterior this is one of the best getaways with bonfires, live music and a lively scene of people coming and going. Roest is the edgy, more alternative city beach on this list. Here they’ve changed an industrial site into a true beach using sand as a base and picnic tables to give you a place to sit. Hidden behind the modern RAI Convention Center, you will find Strandzuid. This city beach will open May 1st and is the hotspot of the city. With beautiful sunbeds, volleyball tournaments and a classy food & drinks menu, this venue takes you right to a hip lounge bar on Bali or Ibiza. Take the afternoon off from the city and doze off while you imagine yourself on a tropical beach somewhere. 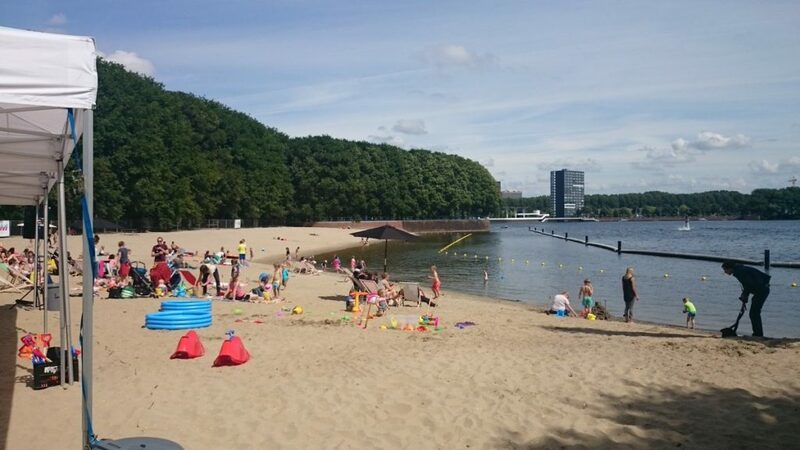 Sloterplas Beach is a bit outside of the city, but therefore also one of the more calmer city beaches. It is not a cultural or local hotspot, but it does offer a nice and quiet lake experience.